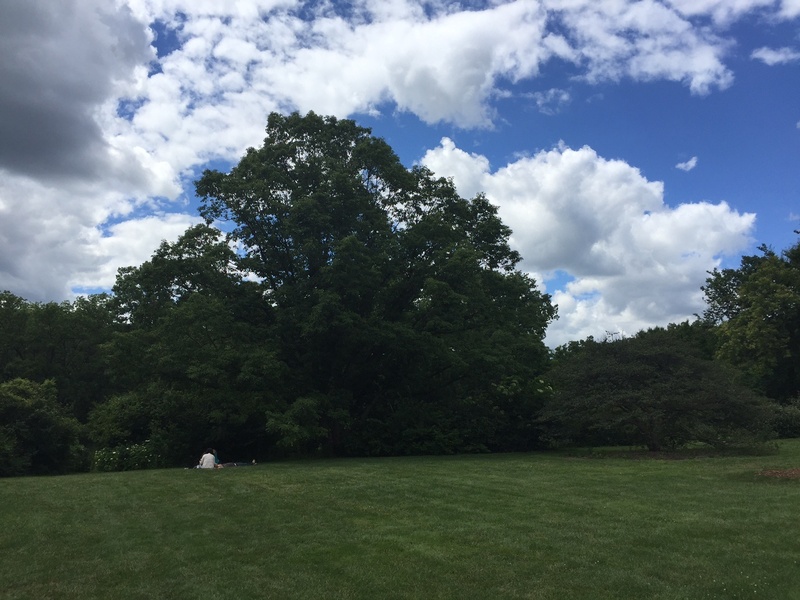 Genis and Daniel had a Morton Arboretum wedding, right beneath a giant tree. I remember because I was there - the couple chose a Backthird pop strings ensemble to play their wedding ceremony and cocktail music, then one of our reception acts to cover dinner and dance times. That was 7 years ago. So last month, to celebrate 7 years of marriage - and 10 years since first meeting - they decided to go back to their wedding spot again. Genis called us with her super-secret plan months in advance. One of her favorite memories of the wedding day was their last dance: They staged a photo exit, dashing to the car along a line of guests with sparklers about 15 minutes befor their reception's scheduled end. But then, they snuck back inside the hall. We closed the doors and played a final midnight dance, Louis Armstrong's "What a Wonderful World," for just the two of them. The moment wasn't planned. But it was perfect. One of Genis's wedding-day regrets was also linked to music: She and Daniel, like a lot of couples, spent much of their cocktail hour taking photos. All their guests enjoyed the pop strings trio, but they didn't catch much of the music themselves. 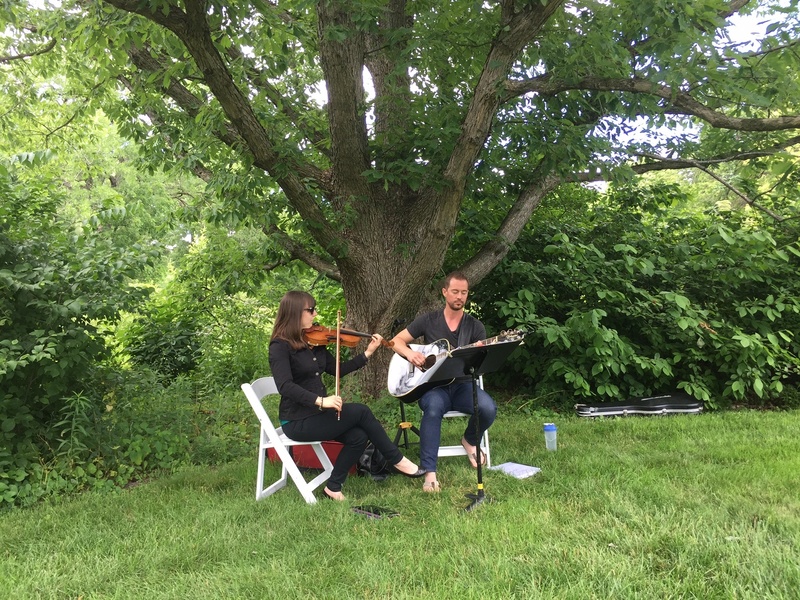 For their anniversary, she wanted to hear that music - in private this time, right back at Morton Arboretum. Here's what Genis had in mind: She and her husband, along with their young daughters, would go for an anniversary picnic beneath the very tree where'd they exchanged vows 7 years previously. Joshua and Katherine from Backthird's pop string ensembles would already be there - suprise! - set up, casually dressed, playing accoustically when the family just "happened by." And that's just what happened a few weeks ago. The family settled in to picnic with their private concert. At Genis's request, Joshua did something he doesn't typically do at a wedding cocktail hour: He sang on about half of the songs. The family sang along with him on "Time After Time." 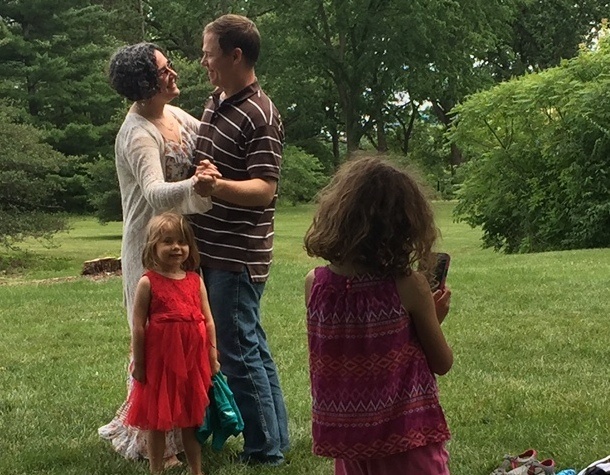 They danced to "Over the Rainbow," Genis and Daniel's daughters trying out their "ballet" moves there in the grass. It was a casual, intimate celebration of another perfectly romantic day that happened in that same spot just 7 years ago. 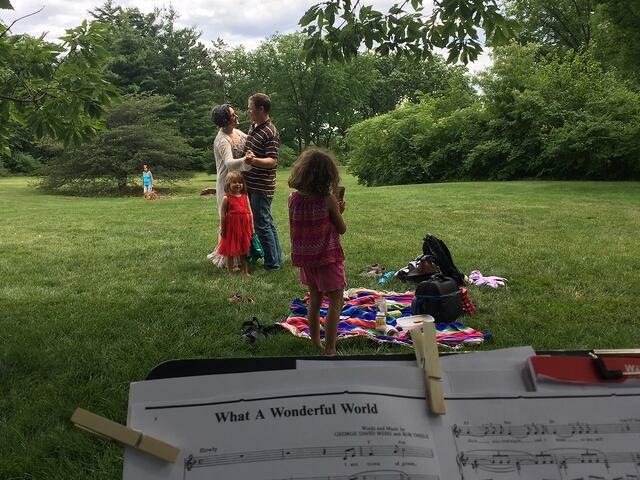 And when the picnic ended, Joshua and Katherine capped the afternoon by playing "What a Wonderful World," the last dance from Genis and Daniel's wedding, once again. The couple danced just like before - this time with several pairs of small hands tugging at their hems.